Wyatt had fallen asleep in the car as we dropped Sam off for his J-5 level ski practice, so not surprisingly, he was not particularly game. And when we got there, the wind was whipping, whipping into the car off the parking lot, and he did not want to go. I bundled him anyway, got his boots on, left his mittens in the seat and told him to open the door and call me when he changed his mind. (We were parked right in front of the course.) He changed it, he wanted to come out but not ski. He changed it again, he wanted to ski but only if I pulled him with a pole. He changed it again–he wanted to ski, but only without HIS poles, and he did. We made it all the way around the shortest loop with no hills once, and I’m calling that a major accomplishment. I may be speaking too soon, but one thing that’s consistently made everything easier is that all of our kids are game for anything, and that includes Rory. 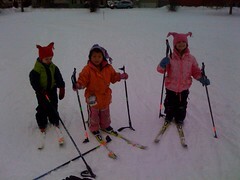 So far, we haven’t had the kid who cries at hockey or ballet, or throws herself down and refuses to ski. Wyatt came closest–he never did want to play soccer, but I’ve only just remembered that. Maybe because we just didn’t make him play. But by and large, they get places, they gear up and they give it a go. I hope they stay that way.